A narrow but easily passable ridge connects this peak to its higher neighbour, Baurtregaum. Caherconree is named after a stone fort situated two-thirds of the way up its western flank, overlooking the mountain road called Bóthar na gCloch ('road of the stones'). This is an inland promontory-fort, consisting of a natural projecting ledge surrounded on three sides by steep cliffs, the fourth side being defended by a stone wall. In legend this is the fort of Cú Roí mac Daire, hero of Munster, who was able to make it spin around at night to perplex any attackers looking for the entrance. The best known story connected with it relates how Cú Chulainn attacked the fort with the aid of Blathnaid, the daughter of the king of Man, whom Cú Roí had taken, none too willingly, for his wife. Blathnaid taunted Cú Roí that his fort was too small for such a magnificent chieftain as himself, and when the walls were down during the construction of bigger fort, she poured milk in a stream (now the Finglas River, from Ir. An Fhionnghlaise, 'the white stream') as a signal to Cú Chulainn that the moment was right to attack. For a fuller account of the story, see The Dingle Peninsula by Steve MacDonogh, pp. 31-33. Nor is this the hill's only legendary association. The summit is known as Fin Mac Cool's Table, while a rock feature on the northern ridge connecting to Gearhane is called Fin Mac Cool's Chair. 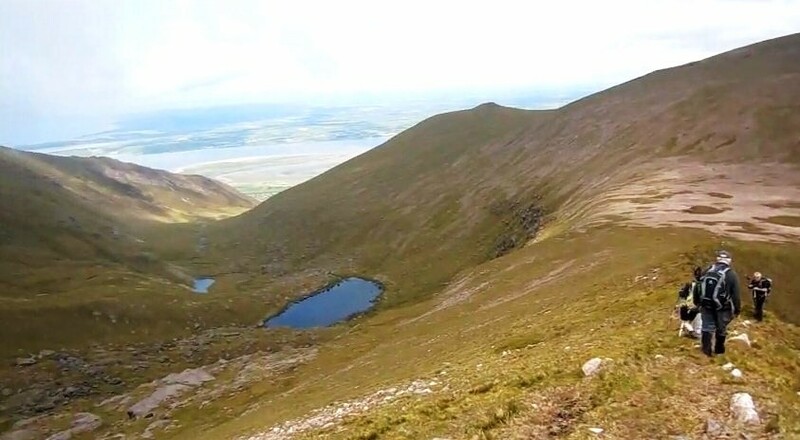 Caherconree is the second highest mountain in the Slieve Mish area and the 27th highest in Ireland.